This international symposium opens up discussion of Spanish art and culture in relation to the construction of discourses of coloniality in 20th-century Spain, especially in the Francoist period. It attempts to identify methodological approaches that would allow us to understand the consolidation of hegemonic colonial discourses and how they continue in Spain today. Organisation: María Iñigo Clavo (Universitat Oberta de Catalunya) of the R&D Research Group “Experiences of the Political in Francoist Spain” (MINECO) with Claudia Hopkins and Kirsty Stewart in the School of History of Art, University of Edinburgh. Please join us at Raven Row next 2 Feb 2018!! An evening of performances, readings and screenings to consolidate the protest at Bowater House against Taylor Wimpey’s Denizen Development. With the participation of: Mark Aerial Waller, Stewart Home, Lloyd Corporation in collaboration with Nina Wakeford, Tom McCarthy, Anna Minton, Katrina Palmer, Chris Petit, Esther Planas, Bill Parry-Davies, Iain Sinclair, Claire Louise Staunton and students from Goldsmiths MA Visual Sociology. There will be an exhibition and sale of artwork related to the protest. Including contributions by Anthony Auerbach, Rut Blees Luxemburg, Zoe Brown, Justin Coombes, Sarah Dobai, Chris Dorley-Brown, Katherine Fawcett, Arturo Soto Gutierrez and Eva Stenram. All proceeds from the sale will go towards the campaign. "Antiuniversity Now is a collaborative experiment to revisit and reimagine the 1968 Antiuniversity of London in an ongoing programme of of free and inclusive self-organised radical education events." 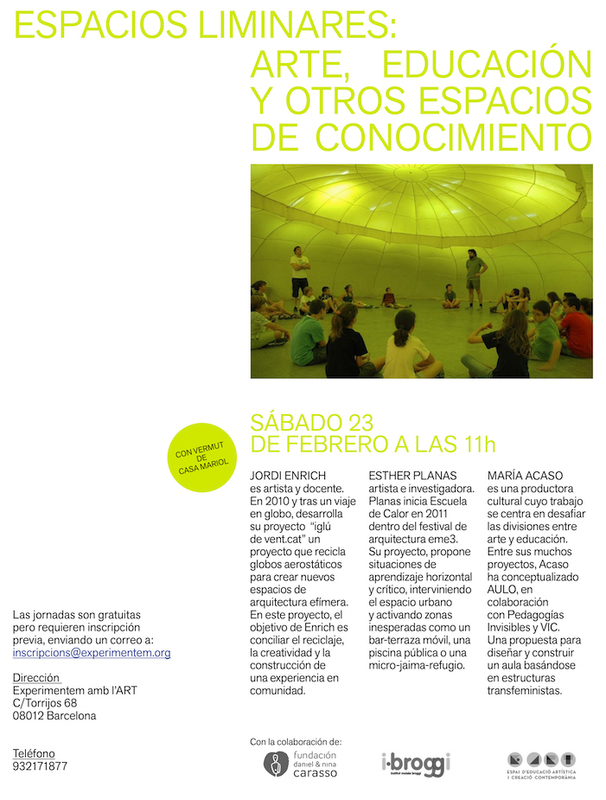 This retrospective celebrates work produced under the first ten years of "Producció BCN"
21 March 2017 Publication : Manifestaciones Públicas de Afecto is a digital publication that reclaims the importance of incorporating an affective dimension to the public sphere that psychoanalysis and feminism have historically made; investigating its possibilities to function as a space of resistance against the policies of neoliberal subjectivation. Avoiding idealizations and recognizing that affects can also have a normalizing function, the publication brings together texts and visual interventions by artists and researchers in whose practice the affective experience emerges as the basis of critical analysis: Valentina Desideri, Andrea Francke, Valeria Graziano, Gelen Jeleton, Mathew de Kersaint Giraudeau, Esther Planas and Florencia Portocarrero. Florencia Portocarrero (Lima, 1981) investigadora, escritora y curadora independiente. Escribe regularmente en la revista internacional ‘Artishock’ y ha contribuido en numerosos catálogos y publicaciones. En Lima es co-fundadora y co-directora del espacio independiente Bisagra y Curadora del Programa Público de Proyecto AMIL.